This collection of historical maps and flags helps etch history into the walls of your space. Featured here are a wide variety of antique maps, map and flag collages and map photographs. These murals reflect the evolution of the map of the world and its various regions and continents. From antique maps of the old world to nautical maps and a pictorial representation of the flags of the fifty states of America within the map of USA, the mural collection reflects creativity and authenticity in equal measure. Prominent among these wall murals are the antique Johnson Maps from the 19th century, a time when American map makers and publishers thrived owing to various factors. The Civil War, the growth of railroads, and the westward expansion of the United States, among other factors, were the reason behind the increased demand for maps and atlases. Mapmaker Alvin Jewitt Johnson was at the forefront of the map publishing industry for close to twenty five years, due to which different editions of the Johnson atlas are considered an excellent record of the events and developments of that time. 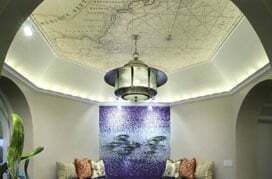 As is evident from these map wallpaper murals, hand coloring in red and green and distinctive borders, iron scrollwork and a Celtic design characterise Johnson Maps. Equally significant were the contributions of 18th-century doctor and botanist, John Mitchell, who created the most comprehensive and perhaps largest 18th-century map of eastern North America, widely known as the Mitchell Map. This map holds historical importance as it was used as a primary map source during the Treaty of Paris for defining the boundaries of the newly independent United States. In addition to these and other extraordinary vintage maps of Scotland, Africa and other parts of the world, the collection also features more modern versions of the map of North America and its states. Also featured are wall murals of the American flag, UK flag, flags of the American states and a collage of the fifty state flags. 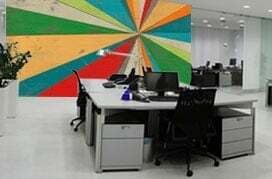 If you’re looking for visually striking wallpaper murals of maps and flags for the walls in your home, study, library or office, in all likelihood, your search will end here.